Washable water filter cartridges for the removal of coarse sediments. Easy and fast cleaning, low pressure drop, duration and long-lasting. The RL SX (DOE) washable filter cartridges are made of a polyester tubular net and characterised by double open end. The RL MIGNON SX (DOE) washable filter cartridges with 5”M height are designed to adapt to the exclusive MIGNON housings. 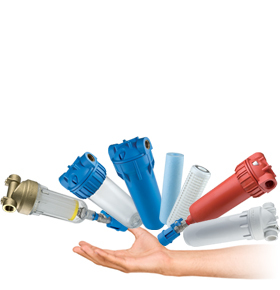 The RL C SX (DOE) washable filter cartridges are characterised by a polyester tubular net and a double open end. The RL A SX (DOE) washable filter cartridges are supplied with AISI 316 stainless steel tubular net for sand, flakes and rust filtration. The RA MIGNON SX (DOE) washable filter cartridges distinguish themselves thanks to 5”M height, with stainless steel net and frame. The RA BIG SX (DOE) washable filter cartridges are equipped with stainless steel tubular filter net, external diameter 4.50”. The SA MIGNON SX (DOE) washable filter cartridges are distinguished by their pleated stainless steel net with a special height of 5”M. The SA BIG SX (DOE) filter cartridges with stainless steel pleated filter net BIG by Atlas Filtri.